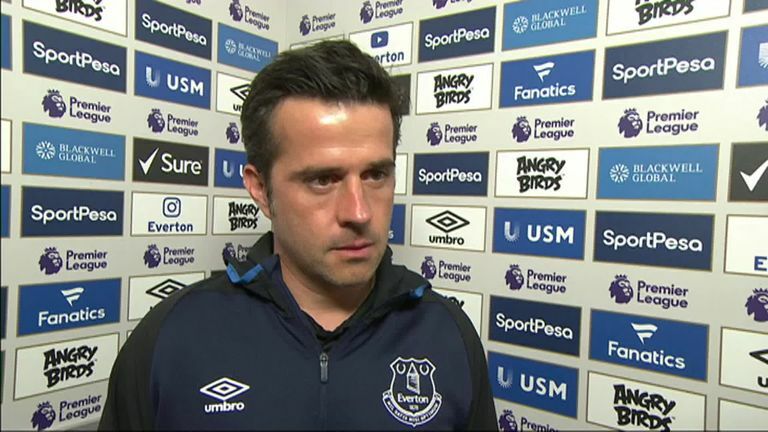 Everton manager Marco Silva admitted his side lacked creativity after a frustrating 1-1 draw against Huddersfield at Goodison Park. Dominic Calvert-Lewin scored the hosts only attempt on target, cancelling out Philip Billing's opener 87 seconds earlier. The Toffees are unbeaten after their first four matches, but a third draw of the campaign left their Portuguese manager ruing the absence of the suspended Richarlison. Silva said: "There was a lack of creativity in the last moment. We can do fast things, but our players have to think in a different way as well. "Of course we prepared to win the game, but the Premier League is always tough. You have to prove in every match and it wasn't the best performance. "I didn't see a good game, and this can happen. We were too slow in possession and we have to move faster as they played to defend. "We knew they would come here playing this way so it's something we have to work on." Everton produced a disjointed performance as they found little rhythm without eight first-team members. A disappointing afternoon for the Toffees was compounded when Theo Walcott limped off in the second half and Silva will be hoping he avoids joining a lengthy casualty list that includes Idrissa Gana Gueye, Andre Gomes, James McCarthy, Bernard, Michael Keane, Phil Jagielka and Yerry Mina. Silva admits the forthcoming international break comes at a good time as he hopes to welcome back a few of the walking wounded before hosting West Ham, live on Super Sunday on September 16. The former Watford boss added: "We played slow in the second half and when you lose an important player like Theo, it wasn't a great moment for us but we have to work harder. "I think the international break is important for us. We didn't have a lot of solutions on the bench to find creativity, and I hope in the next 10 to 15 days some of the players can return to the sessions to help us." Pick your team for Watford v Tottenham to win the guaranteed £1k jackpot.